Q: At that time did you assistants pay much attention to the pay at other schools? Q: What was it that finally took you away to New Mexico State? TS: For me, it was the opportunity to be the head football coach. I knew I was going into a tough situation, trying to win down there. Matter of fact, I had a team that went 1-10 the year before and all of that, but I just wanted to get an opportunity to see what I was capable of doing. I went down there thinking I could put together a pretty good staff of guys. 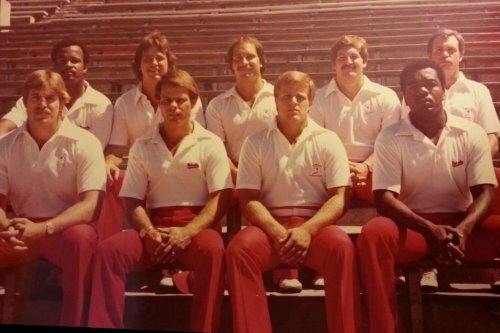 I had watched them –personally- as GA’s at Nebraska, guys who had moved on, so I believed I was gonna go down there and, not that I was a great guru, but felt that the staff I put together was really a great bunch of coaches. And I figured we’d have a great bunch of coaches and we could all get it done, you know? TS: And we had Gerry Gdowski, and Steve Stanard who’s the Defensive Coordinator at Tulane, Clayton Carlin at Cornell as Defensive Coordinator, Rich Glover at Defensive Line, Kendall Blackburn who was at Nebraska for a short stint as GA who helped bring Derek Brown to Nebraska, and Bill Busch, who was a GA at one time. Q: If I recall, you did a pretty good job of turning things around there. TS: The overall record? If you know, it usually takes about 3 years to get yourself on par (and we basically had to start over from scratch), but we had a great running back down there. You look at most programs, the third or fourth year you finally make your hay, you know? We had a great staff, had kept one guy from that prior staff. And everybody else going in, they all had Nebraska ties. I felt it was important to have a lot of guys who didn’t have to discuss a whole lot of things so we could hit the ground running. It prevented a lot of arguments about every little thing. Same philosophy on a lot of things, which helps. Q: So you’ve taken that same mindset to Southeast Missouri State University? Q: Wasn’t Clayton the high school coach of Miami quarterback Frank Costa, who we met in the national champ game? TS: Yes, he was. He was the high school coach at St. Joe’s Prep in Philly. And when we played Miami he was on our sideline, instead. Q: Was Clayton able to impart some special insight about how to attack the guy? TS: We got beat by OU and then we went down and we got beat by Georgia Tech in the Citrus Bowl. In my mind? That was the turning point in my mind. For Nebraska it was still decent -we still won 9 games and all those kind of things- but in my mind (again, I can’t speak for anybody else) that was an all-time low for me as a part of the Nebraska system. Getting beat by Georgia Tech the way we did, I had no idea why. We’d had worse losses, like that Iowa State loss in Ames in ’92 -I would rank that as a low- but for some reason for me the Georgia Tech loss really ranks high. I don’t know why, but that was a turning point. It was tough, because one, we were in a bowl game but we didn’t have any chips on the table to play for other than to play for pride, and as you know, being part of that program, how big that was. If you go back and take a good look, that was really tough. Q: What was the most impactful change to come from that low point? TS: I think we started really thinking and deciding to go to the 4-3 look. If there were any other real pragmatic changes, I know I made an effort to spend more time talking to other players other than just my position, trying to get inside their head. I always talked to all the fellas, I always saw myself as a guy who could notice the freshmen or guys struggling and tried to get them to see different things and give them a couple words of encouragement to keep going. I spend much of my time doing that now. Q: Was that something you did on your own or was it encouraged for the whole staff? TS: I think I did it, anyway. Coach Osborne always gave us freedom to be ourselves. If you look at all the staff -you’ve been around them- we were our own personalities. We weren’t any clones. Everybody was themselves, you know? We had a tradition to pass it on, you know. There was somebody there, back when I was a freshman, who looked out for me. Whether it was something the coaches encouraged or what, that’s just the way it was. Q: You said we had some tremendous talent in those years. Anything else stand out to you as far as separating us from other teams? TS: I felt when we switched the defense it really got things up and running. Obviously, I remember our offensive line going from good to great. That really jumped out at me, too. There was a stretch there where we were a dominant offensive line, going back to that game. And I thought, of course, when Tommie Frazier showed up. He was made for our type of offense. Q: I think that discombobulated a lot of people over the years because of our recruiting class rankings of #19, #31, that type of thing. Then those same guys are wearing National Championship rings a few years later. Did you know what you were looking for precisely? TS: Back in those days there were different people around the country where everybody had their area. I had Texas, myself and Jack Pierce had that area split. You’d get on the phone and call people. You still had people that gave you lists of names, and sometimes you had people who’d give you their ranking, but we would get those lists and start either calling them, checking on them, watching film on them. 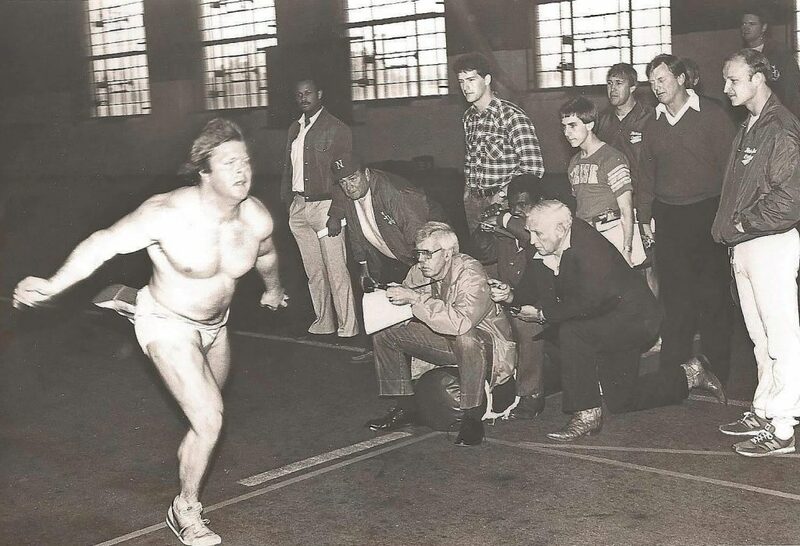 Recruiting was very different than it is today. Q: What would you say the greatest difference was? TS: Timing. Nowadays you get juniors. A lot of kids are already set at that time, going into their senior year. In our day, it was a very, very, very rare occasion where you didn’t have time to evaluate a kid’s situation and then have them make a decision. It was different that way, for sure. But we still had a lot of things going, it just wasn’t as fancy as it is now. It’s a full-blown business now, where you have some people making decent money on it. With changes brought on by the computer, it’s really changed it. Q: Was there a certain mindset you taught along with the techniques? Infused into the guys? TS: Well, we were the ‘difference makers’ in my mind. We could ruin games, in my mind. That’s what they all had to know coming in. ‘If you’re in this room, you’ve gotta win. You can change games from this position. Every Saturday, every guy who throws the ball, you sack him. On every throw you need to bother them. Sacks happen. You bother a guy. Sometimes you only sack a guy one play a game, but when you touch him and touch him and touch him, he starts to feel your presence. He’ll force some bad throws’ and things like that. TS: Yeah. That, to me, was the ultimate showcase for, in particular, the Defensive Ends. Because you had a quarterback who wasn’t mobile. And we weren’t worried about taking chances because we didn’t have to worry about the ‘contain.’ They left us one-on-one a lot of times with their tackles and ends, and we were able to come underneath and counter and do some things. And don’t forget now, we were able to get good pressure from the inside as well, the ‘push’ at the front where Costa wasn’t able to step up and throw, so then the ends would scream off the edges and go outside and in. TS: Exactly. You want them to throw off the back foot, make them have an off-day. Q: In prepping for the ’94 Florida State game, was your approach different with Charlie Ward at all? TS: I don’t think so. I thought we were gonna be coming back down there having a great chance to win. And when I walked into the locker room after the Florida State loss, there was Trev and some of those seniors already telling those guys to come back down and win it. The mindset was changed that night. Q: In what ways, Tony? TS: And so having that feeling, if you go back and remember we went down there many years and were getting beat. And if you remember, one year we got shut out by Miami. But, no matter how you cut it, your guys starting getting to wondering if they can. And the Florida State game, I think, told us that we can come down here and do something. I know that might sound strange for a team that’s winning 10-11 games at a click, but you show up at the Orange Bowl and get beat 3 or 4 years in a row, that gets a little tough, you know? You play the Florida schools that are already acclimated and basically own the place. I thought that game was a combination of confidence and more determination to realize, “You know what, we can beat these guys. We can get it done.” It turned it into a really great atmosphere for the players to prepare to come back down. That was the ultimate goal from day one. I remember when the phrase was coined: Unfinished Business. The team, and pretty much the state, that became a state motto in my mind, not just a team motto. (laughs) That Florida State game was a full-blown war, a full blown toe-to-toe heavyweight fight, blows coming from all angles. That was as physically taxing a game as I’ve ever been around. The intensity? Wow! I was in the press box back in those days, and you could still get that feeling all the way up there.